Fox News Opinion: Can we inspire patriotism? This article was originally published in Fox News Opinion; to read the article on their website, click here. Of the midnight ride of Paul Revere. I’d never read much past that, but when I did I was stunned: the poem was incredibly beautiful and inspiring. How had I missed it all these years? It was also very long! But it was so fantastic that I couldn’t help wondering if my daughter and I might try to memorize it together. Generations of Americans had memorized it. That used to be one of the ways we passed on our cultural history and celebrated what we all had in common as Americans. So my daughter and I decided to give it a shot. And amazingly we succeeded! Because she was seven, my daughter got it memorized before I did. And because I was not seven I got choked up at many of the patriotic lines, which were deeply moving. One thing the poem did was make me realize how much I had failed to appreciate the magnificent nation in which I was privileged to be born and grow up. Its lines reminded me of the huge sacrifices so many made so that we could have the freedoms we have today — freedoms many of us probably take for granted. I realized that my entire generation had missed out on what previous generations had not: celebrating the greatness of our nation and its heroes. The more I thought about it the more I realized it was a tremendous mistake, one that we are now paying for in many ways as our culture and nation become increasingly divided. Being an American is something we need to learn and understand. We are not an ethnic or religious group. America is the only nation in the world based on an idea — freedom and self-government — so if we don’t understand that idea and what sacrifices were made to win that freedom and keep it for over two centuries, how can we possibly continue to keep it? How can we call ourselves Americans? I came to the conclusion that it’s vital that we teach our kids about our past — and especially about the heroes of our past. So I actually wrote a whole book on this subject, titled “If You Can Keep It: the Forgotten Promise of American Liberty“. As you might expect, I devote nearly a whole chapter to talking about “Paul Revere’s Ride.” And everywhere I go I talk about what’s in the book, and about my hopes of inspiring a new generation to love this great country. But two months ago, I got another idea. Since I now have a national radio program, I thought, what if I sponsored a contest for kids to memorize “Paul Revere’s Ride”? The deadline for entries could be April 18th, the famous date in the poem. The problem was I got the idea so late that kids would barely have three weeks to do it. But even if five kids took me up on the huge challenge, it would be worth it. So I announced the contest on the air. The most creative and overall best recitation of the poem would win. Naturally they’d have to post their entries on youtube. I would take the winner — and their parents — to dinner here in New York, where I live, and I’d also interview them on the radio program and give them signed copies of almost all of my books, plus Eric Metaxas Show mugs and tee-shirts! I’m sure it was the tee-shirts that did the trick, because even though there were only three weeks, we got no less than fifty submissions — and all of the kids had memorized the entire poem! One of them was four years old! Did I mention what a long poem it is? I was staggered. So many of the submissions were so terrific there was almost no way to pick a winner! Several of them involved props and costumes — and three of them featured actual horses! One young lady traveled all the way from Indiana to the Old North Church in Boston to film her recitation there! Two kids from Lithuania even sent in videos, as did one from Berlin, Germany! And one kid recited it while riding his bike! Some of it is also absolutely bust-a-gut hilarious! Whether intentional or not I will leave up to you. If you watched all fifty videos without a break it would take you eight hours straight! So I thought we should make a fun compilation video featuring allof the kids who participated, in the hopes of getting you and your kids and your friends to watch it, so that maybe you would all get as excited as I am about it — and maybe you’d even challenge your own kids to memorize it! Well, that was my idea. Now it’s up to you. I want to make the video go viral and light a spark that will carry the torch of freedom onward, and I’ll need the help of thousands of Paul Revere’s like you and your kids to carry it. Is that too corny for you? Tough luck. It’s the truth. God bless you. And God bless America. 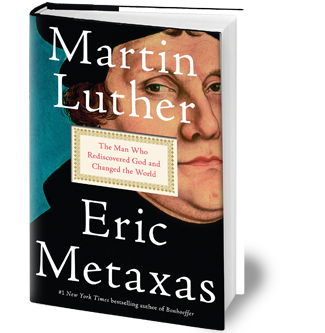 Eric Metaxas is the author of several bestselling books, including “Bonhoeffer” and “Amazing Grace.” His latest book is “MARTIN LUTHER: The Man Who Rediscovered God and Changed the World” (Viking).